Depending on what kind of engine you have, servicing your turbo can get expensive fast. That’s why, if you don’t notice your engine acting up, you might be tempted to ignore any signs of abnormal turbo condition and call it good. However, if you see any of the following signs, you need to consider sending out your turbo to be serviced, regardless of how your engine is acting. As you can see in the left image above, the turbine is off center, and shifted to the bottom right. This can be a serious problem. 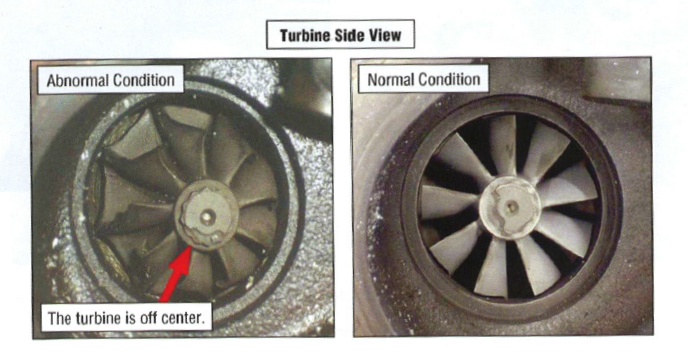 The normal condition for the turbine, shown on the right, is to be aligned centrally; it should not be shifted in any direction. The above images are from the compressor side view. You can see in the left image that there are contact marks on the blades and surrounding area. These can indicate wear on the turbocharger, though they won’t cause abnormal function that you would notice while driving the vehicle. You can also see in the left image above that the blades are deformed. You can see that compared to the normal condition of the turbo, on the right, the blades’ shape have altered considerably. All engine parts are designed with intention and precision, so deformation of the blades can drastically affect performance, and potentially lead to unknown damage. Does your turbocharger need a bit more help than just being serviced? If it’s causing engine problems, you need to replace it. If you need to replace a faulty turbo or have questions about getting it serviced or replaced, give HHP a call at 844-215-3406 or request a quote online!